the rain…drizzle drizzle…kept me in(and probably just as well, you say)..however the Bacardi Anejo and espresso kinda make up for it. 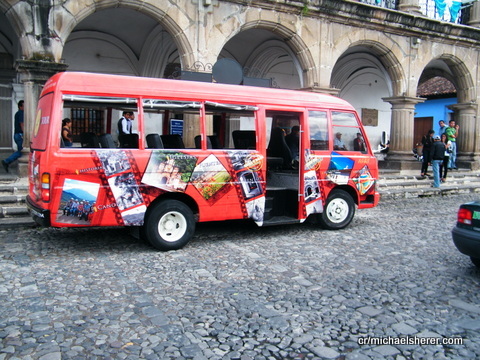 Walter Fischer and his partners, who picked up Juan Carlos’ defunct Antigua Bus Tour, have repainted the bus(his says they’re adding another 3) and…so on and so on..the bus is being seen driven around town, which is a start. So? 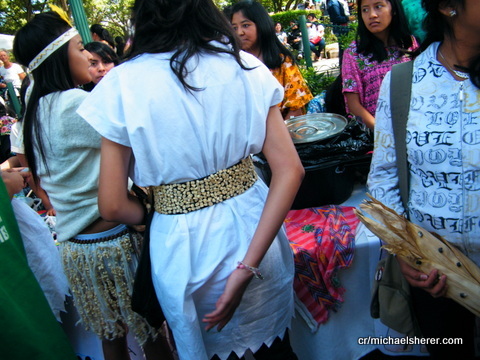 the 2nd or 3rd Festival de Maiz (Corn Fest) that I’ve been to…I ran into an ex-INGUAT official who didn’t know anything about it…I asked an Antigua-born guide about it..zip, nada..for people who are in the tourism business, one would assume, etc. news from our wandering troubador, Nelson Lunding..he’s way up on the northern california coast, in places that few of us have ever been to, much less heard of..#1..point Arena? #2 Gualala?..I know ’em both..big deal, right? WTF in either case..too far south to pick up any of the Emerald Triangle aka dope biz from Humboldt..who knows? the ‘Perfessor aka Mike Donley, checking in from the Pacific northwest…says he’s ‘sold’ his boat’…o please, God…the two happiest days for a boat owner are the day they buy it and the day they sell it..s’posed to be back in A-Town around the end of October and a good thing…at least two ‘professional women’ have confused the two of us…as being the one and same…since my hands are clean, my conscience clear, it’s gotta be him..
final thoughts on a rainy Friday night and a conversation with a pub owner re: nightlife..the Three Aces in Hyderabad, Athens/Mykonos, the Bulldog/Amsterdam, El Gato Tueto/Havana, Lips/San Salvador, Hotel Del Rey/San Jose, Club Exotic/Reykejvik, The Library, ‘Vegas, (fuggedabout Crazyhorse II), Patpong Street, Bangkok, Copa de Oro, Juarez and for local color, Club Exceso in Xela..Antigua well never catch up or come back to what it might once have been: get over it. The Beige Patrol runs it.